This article by JACQUELINE CHARLES appeared in The Miami Herald. The water inspectors were negotiating with an irate homeowner over her illegal hookup when a neighbor signaled he wanted to talk. “I would like to know how I can get water access,” physician Cyprien Jean-Jonas said from inside his one-room clinic. Moments like these are small but growing in Haiti where thousands of cholera deaths from contaminated water have residents increasingly worried about the quality of their water. Now, a push by foreign donors and the Haitian government to improve access to safe drinking water is giving Haitians an incentive to legally pay for water which most buy on the streets by the bucketful or siphon off illegally. Once a model for water-pipe service, Haiti today has the hemisphere’s worst access to safe drinking water and sanitation. For months, a team of inspectors from the national water and sanitation agency, DINEPA, has been canvassing metropolitan Port-au-Prince for clients who are either in arrears on payments or illegally siphoning water. The goal isn’t just to collect, but also to cut down on water losses and help engineers figure out how to improve a dilapidated water network. Unlike the state-run electricity company that loses an estimate $18 million a month to theft, donors and Haitian officials say they don’t know for certain how much water is lost to theft or leakage — but estimate it could be as much as 80 percent of what’s produced. Until recently, the country had no idea how much water it produced, and the water agency wasn’t collecting enough money to make payroll. Meanwhile, those fortunate enough to have water piped into their homes could only depend on getting service no more than a few hours, twice weekly. “Water issues are always extremely difficult everywhere and more difficult in Haiti,” said Luis Alberto Moreno, president of the Inter-American Development Bank, which has teamed up with Spain to provide sanitation and safe drinking water. Together, Spain and IDB are investing almost $180 million in projects in four regions, including Port-au-Prince, where half of the population buys water from vendors. Projects range from helping repair reservoirs damaged in the 2010 earthquake to installing water kiosks that sell chlorinated water to improving water quality through regular testing and chlorination. Meanwhile, foreign consultants have spent the last two years helping Haitian officials restructure both DINEPA and its operating water authority. The goal is to improve continuity of the service, and increase revenue and billing by reconnecting delinquent customers. On a recent weekday, as technicians walked door-to-door, they carried a printout of addresses and names. They began by asking a series of innocuous questions about the service, whether the homeowners had access and why they hadn’t paid. Customers offered a range of responses from poor service to not understanding their bills. So far, the efforts seem to be paying off. Officials estimate that by the end of 2014, they will have more than 65,000 billed customers on the rolls — up from 30,000 in 2011. In addition, 86,000 Haitians today are benefiting from dozens of water distribution networks mostly in rural communities. “We have technicians walking in the [communities] explaining the water issue,” said Lionel Duvalsaint, the head of DINEPA. A former New York City water engineer, Duvalsaint likes to tell the story about the day last summer the water pump was turned on after four years in the northern village of Grande-Rivière-du-Nord. The crew had been working feverishly for weeks. On the eve of the town’s patron saint celebrations, Duvalsaint called over a little boy and told him to bring a bucket. The kid looked skeptical. Daniel Ovide, a resident of Anse-a-Veau, an isolated rustic village in the Nippes region, agreed. Though the town currently receives free potable water six days a week from a charitable organization, Ovide and others welcomed a recent visit by the IDB’s Moreno and Haiti President Michel Martelly to announce the Bank’s financing of a $1.6 million water network. But providing something as basic as water remains challenging in a country with limited resources and where people have been allowed to build haphazardly without urban planning. That reality is not lost on donors, said Spanish Ambassador Manuel Hernández Ruigómez. Helping Haiti provide water and sanitation to the population is a huge priority — “and will take patience,” Hernández said. At the start of the cholera epidemic, Spain financed the construction of a wastewater treatment plant — one of only two in the nation — on the outskirts of Port-au-Prince. The second plant, constructed by U.N. agencies, is off-line because of a lack of funding. Since its outbreak nearly a year after Haiti’s deadly January 2010 earthquake, cholera has killed 8,120 Haitians and sickened 658, 053. 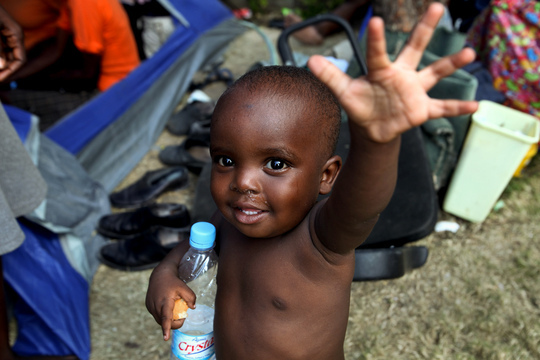 Earlier this month, U.N. Secretary General Ban Ki-moon reiterated calls to the world’s philanthropists to help “fill a severe funding gap” in Haiti’s fight against eliminating the waterborne disease. Outside of Port-au-Prince, where most water springs have long dried up and rural populations have even less access to potable water, efforts are also underway to help address sanitation and water access. Along the Artibonite River, where cholera first broke out, DINEPA has built dozens of plants to treat river water. In Les Cayes and Jacmel in the south, customers are getting water piped into their homes for the first time. Still, the biggest challenge for Haiti — along with figuring out how to produce more water — will be maintenance of the network, donors say.